I was sitting at my desk looking for an article that I recently saw about the importance of being a responsible corporate citizen for this blog. I was also going to reference some of the great volunteer efforts, charitable donations and random acts of kindness I’ve seen during my short time at TDS (seven weeks and counting). And just like that I became the recipient of one of those random acts of kindness. A few weeks ago I had the opportunity to interview Dave Wittwer, TDS’ CEO, for a story we did internally about his 30-year anniversary (Catherine Morgan, one of our bloggers, also wrote a piece about Dave for his anniversary. Click here to check it out). After we wrapped up the interview we had an interesting and enlightening conversation about TDS’ founder Roy Carlson. 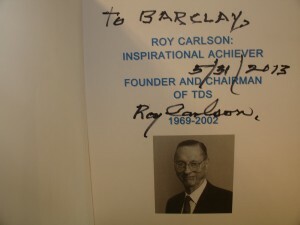 At that time Dave went over to his bookshelf, grabbed a book about Mr. Carlson called “Roy Carlson Inspirational Achiever Founder and Chairman of TDS,” and gave it to me. I thought that was a very kind gesture. Fast forward to now (I couldn’t make this story up). I’m sitting at my desk working on this blog. I hear a voice say, “Hello Barclay.” I look up and to my surprise it’s Dave Wittwer! Shocked, I say, “Hello Dave” and shake his hand. Honestly, I was a little worried about why the company’s CEO was standing in front of my cubicle. Then he hands me a copy of the book he gave me in his office. Well, not an exact copy because this book was signed by Mr. Carlson. I was absolutely floored! What I’ve found is that TDS is always thinking of others and working to improve things. And random acts of kindness aren’t so random. At this very moment TDS is collecting supplies for veterans and also trying to earn $10,000 for the Ronald McDonald House in Milwaukee as part of The Business Journals Social Madness competition. The way it works is the company with the most social media engagement between now and June 17 will move on to the next round. You can click here for the official contest rules. TDS is in the “at large” division in the “large” category. We’re competing against companies like IBM, Walgreens and Kaplan University. Only the top eight companies advance. As of June 6 we’re in eighth place. But you can change that. If you haven’t already, go to facebook and like us, or follow us on Twitter. The more you interact with us on social media the better. You can favorite one of our tweets, re-tweet us, like one of our status updates or leave a comment. You can also vote for us by heading to the Social Madness web page. You only have until June 17 to help us get one step closer to earning $10,000 for the Ronald McDonald House in Milwaukee. So get to it! Please and thank you! Great article Barclay. I like how you demonstrated that the culture of this company really does start with our CEO, Dave Wittwer. Hopefully more organizations can see the importance of that human, approachable, “making an impact” approach. Thanks! It was a treat for me and it just reinforced why I love my job.